Inscribed at the lower left (by Dürer? ), at the join where the corner has been cut off and replaced, in brown ink, with the remains of several letters (t, n [or u]). Watermark of a Gothic P with a flower (similiar to Piccard 1961-, vol. 4, pt. 3, sec. 9, no. 1019 [Upper Rhine, 1473/74]). 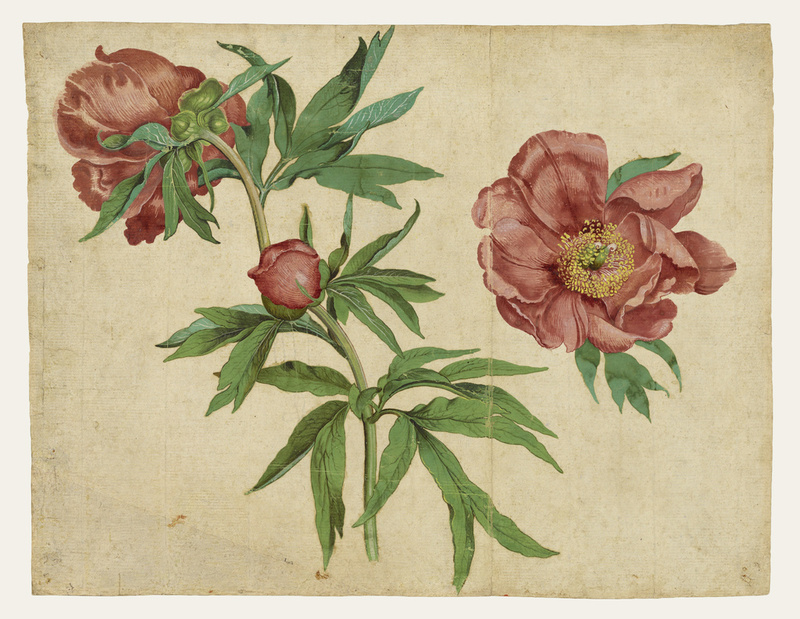 One of the earliest surviving northern European botanical studies drawn from life, this drawing shows a fully opened peony bloom, viewed first from the front and then from the back, and one bud. Martin Schongauer achieved subtly gradated coloration by laying in the basic forms in a broad painterly wash and then describing the details in bodycolor, opaque water-based color, with the point of the brush. Though an outstanding example of a highly finished drawing, it was made as a study for the painting, The Madonna of the Rose Garden of 1473, in the Dominican church in Colmar. During the late 1400s, people began to perceive the natural world in a radically different way. They ventured out into nature to study it and record it firsthand. Along with others artists, Schongauer became one of the leading pioneers of an effort to make studies directly from nature.